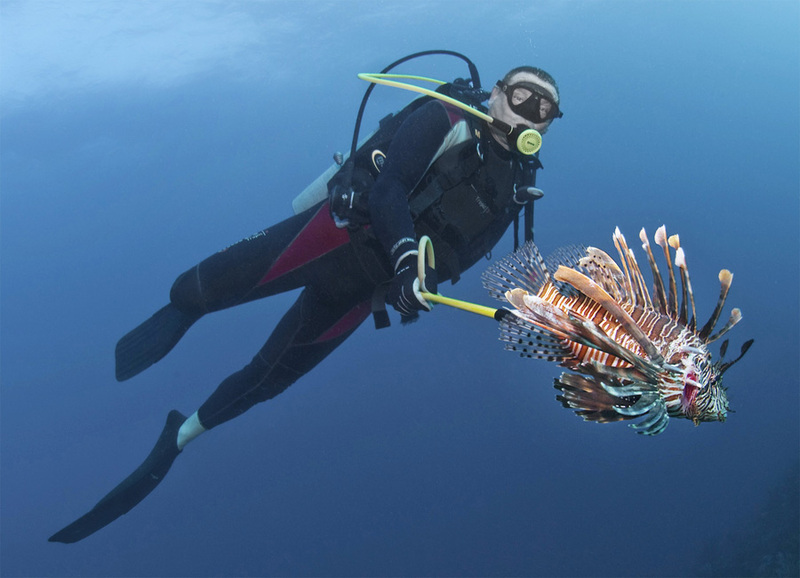 The Belize Lionfish Project, through ECOMAR, received support from COMPACT to promote a nationwide awareness campaign that would dispel myths about lionfish and increase our knowledge on lionfish infestation in Belize. ECOMAR carried out the project in close collaboration with the Belize Fisheries Department. The project goals were far reaching and success in many areas have been realized. In 2010 ECOMAR received a grant from COMPACT (the Community Management of Protected Areas for Conservation Program) which is affiliated with the United Nations Development Project (UNDP) Small Grants Program (SGP) Global Environmental Facility (GEF) and the United Nations Foundation. The grant would be used to enhance the activities of the Belize Lionfish Project and conduct a multifaceted program which includes monthly lionfish tournaments and outreach programs aimed at educating stakeholders on the invasive lionfish. Project goals and activities included the following topics as are outlined below. Produced by Richard and Carol Foster of Wildlife Film Productions, this 20 minutes piece discusses the multifaceted project activities and the way forward for managing lionfish in Belize and the Caribbean. Distributed at the 12 coastal community Lionfish Outreach Workshops were educational materials which included stickers, fact sheet, puzzle page and posters all about the lionfish. Many of the materials have been produced in both English and Spanish. At these workshops ECOMAR also tried to offer lionfish tasting but sometimes had difficulty getting any lionfish to cook. But when it was offered participants enjoyed the lionfish! A documentary has been produced titled: The Belize Lionfish Project: A Local Response to a Regional Problem that documents the history of the invasive lionfish in Belize and how all stakeholders are working together to manage lionfish. Garner support from stakeholders - fishermen and marine guides - in managing lionfish by coordinating monthly lionfish tournaments. ECOMAR has been working with the Belize Fisheries Department to develop acceptable culling devices that can be used on SCUBA and to also prepare Lionfish Hunter ID Cards. These cards are in the final stages of development and will be issued at the closing ceremony that will be held in June. To facilitate delivery of lionfish by anglers into the Monthly Lionfish Tournaments, weigh stations were established with partners throughout Belize. These weigh stations and partners were key in making the monthly tournaments a success. Prizes were awarded to the Top Fishermen, Top Marine Guide, and Top Boat for the months May through November 2010. The most popular prizes were cell phones, ice box, and bicycles. Grand Prizes will be awarded to the overall winner and the Boat Category prize is an outboard engine, overall Fisherman is a stove, and overall Marine Guide is an Underwater Camera. These prizes are expected to be awarded in June 2011. 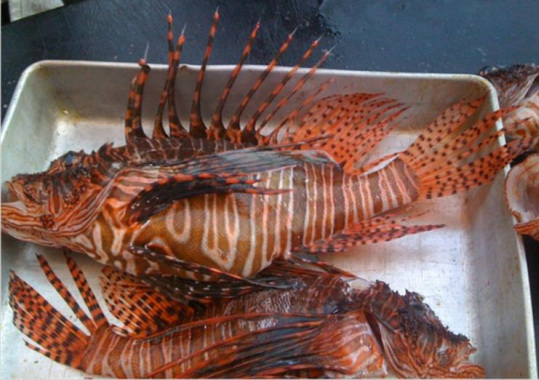 Educate key stakeholders on how they can become involved in protecting their future livelihood by encouraging restaurants to offer lionfish for sale and to encourage tourism associations to coordinate lionfish tournaments. On San Pedro, Ambergris Caye, the San Pedro Tour Guide Association and Wahoo Lounge in association with Coral Reef Alliance and Hol Chan Marine Reserve have organized two lionfish day tournaments and have received more than 500 fish each day. The Placencia Tour Guide Association and Southern Environmental Alliance organized their first lionfish tournament where again more than 500 lionfish were brought in. 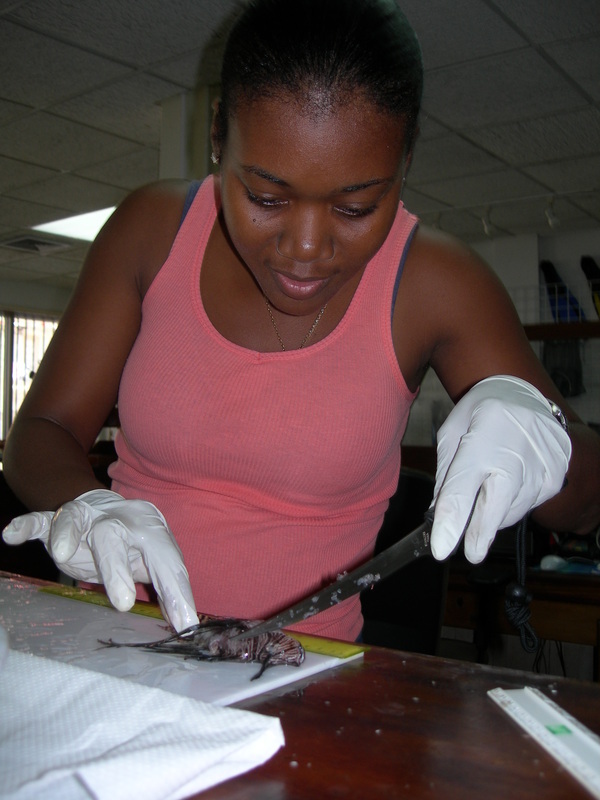 Many of the lionfish entered into the monthly tournaments were measured and stomach contents were examined. Results indicate that lionfish are reproductive at 6 inches total length. As such, fishermen and marine guides are advised to capture all fish 6 inches or greater in order to help control population levels. Determining the orginin of lionfish in Belize was the topic of a collaborative study with the United States Geological Survey. 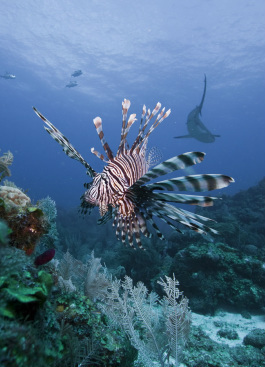 Scientists in the United States studied the distribution of lionfish throughout the Caribbean included 70 samples in their study that ECOMAR and partners collected 2009. The results indicate that the Belize lionfish include the same haplotypes - H01, H02 & H04 - found in lionfish from neighboring countries. In 1996 when the Belize Barrier Reef Reserve System was founded, lionfish were not a threat to this unique marine ecosystem. However, 15 years later they now rank among the top of the list of threats to our reef. Project activities have garnered renewed enthusiasm and interest in protecting the Belize Barrier Reef Reserve System World Heritage Site and associated marine areas. In presentations to the 12 coastal communities the history of the Belize Barrier Reef Reserve System World Heritage Site was presented and details on which protected areas made up the park were included. Information on the Belize Barrier Reef World Heritage Site has also included in the educational materials prepared and distributed. 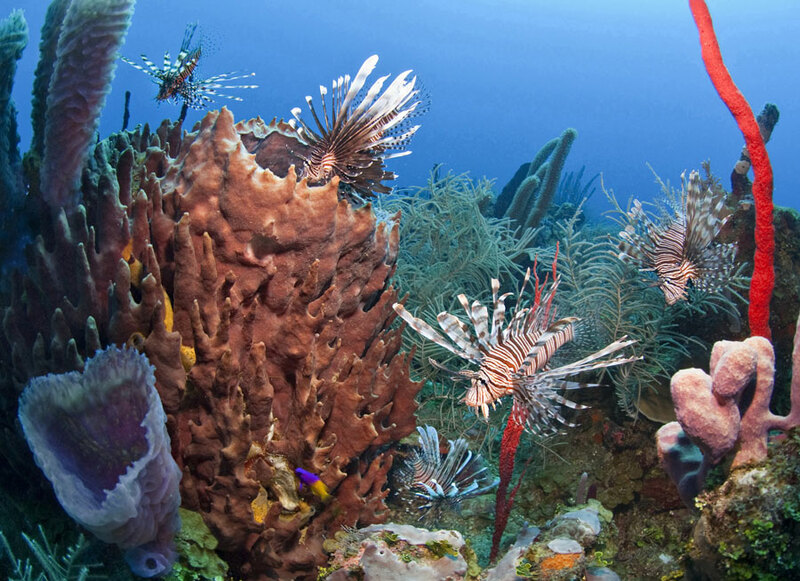 Strengthen the Belize National Coral Reef Monitoring Network in developing the Belize Lionfish Management Plan is one of the final activities being undertaken by ECOMAR. Meetings were held with Coral Network members and other industry stakeholders where they reviewed and discussed the contents and way forward with managing lionfish in Belize. When finalized we will make available the plan online. Managing lionfish is one of the primary goals of the Belize Lionfish Management Plan. Photo courtesy Antonio Busiello. 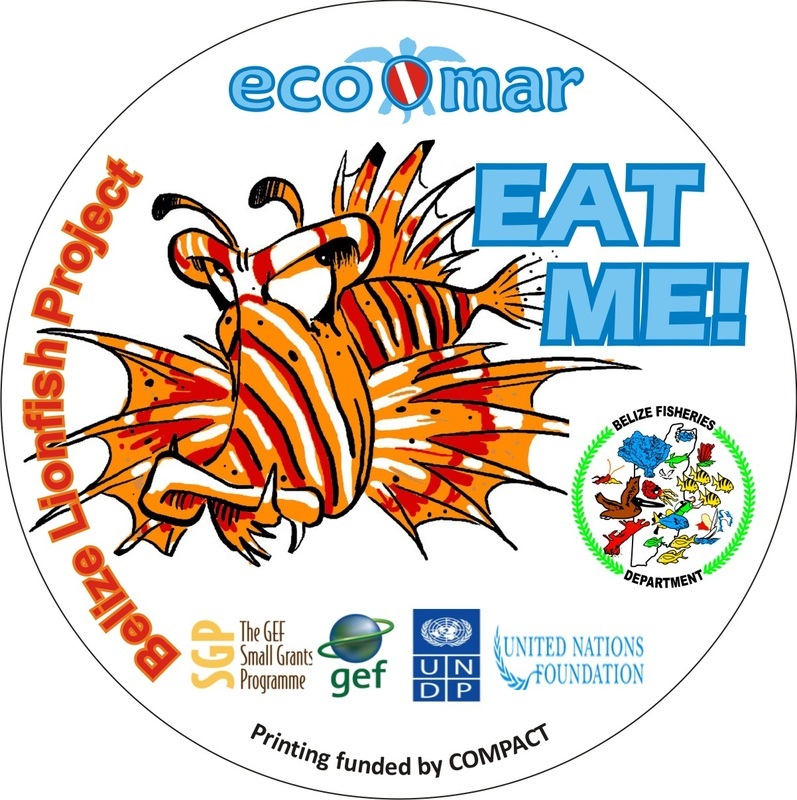 Look for the Lionfish Project stickers at restaurants and dive centers throughout Belize! 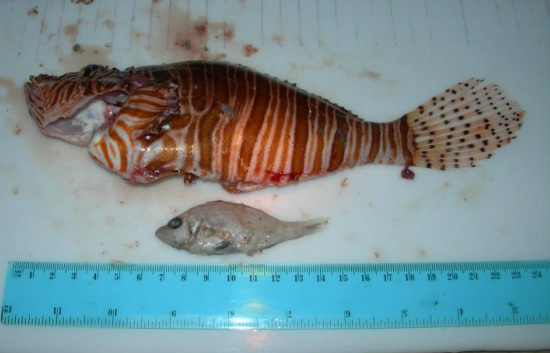 The COMPACT Lionfish Project activities closed in 2012. ECOMAR continues to work closely with the Belize Fisheries Department to focus on addressing recommendations outlined in the management plan which includes managing lionfish removal and testing for ciguatera.